Midway through The Trip to Spain, Rob Brydon tells Steve Coogan about a radio interview in which David Bowie almost mentioned Brydon, except the late pop-star couldn’t remember the Welsh comedian’s name. The anecdote encapsulates Brydon’s underappreciate career, but he finds a silver lining: before his death, Bowie followed Brydon on Twitter. Coogan, who usually gloats about his more prosperous career, now envies Brydon, if only for a moment—and it’s not for Brydon’s happy marriage, two children, or his apparent contentment with a comparatively modest celebrity. Coogan envies him over a Twitter follow. For Coogan, playing a perpetually dissatisfied and narcissistic version of himself in director Michael Winterbottom’s newly formed trilogy of European dining hang-out films, it’s a major blow to his ego. But soon the backdrop of Miguel de Cervantes, the Spanish Civil War, and the Moorish invasion has a curious effect on him. To be sure, Winterbottom could not resist dressing Coogan and Brydon as Don Quixote and Sancho Panza, respectively. Preceded by The Trip (2010) and The Trip to Italy (2014), the relaxed voyage to Spain finds Coogan and Brydon once again touring Europe’s finest restaurants, this time along the historic and picturesque Spanish coastline—all on the pretense of writing restaurant reviews for the Observer and the New York Times. (Do they ever get around to writing these reviews?) Winterbottom and James Clark’s gorgeous documentary-style lensing capture chefs assembling their culinary marvels in the kitchen, leaving the viewer to salivate (eat well before the film, or you may eat too well afterward). Even so, as Coogan and Brydon sample their small plates, they seem only momentarily interested in the visual presentation or flavor sensations. Nothing can distract them from their droll, witty conversation and dueling celebrity impersonations. Fans of the first two films will recall their debates about who can perform the better Michael Caine, Sean Connery, and Roger Moore. They’ve added Bowie and Mick Jagger to their repertoire. The Trip to Spain is arguably the funniest of the three, and certainly superior to the first sequel. 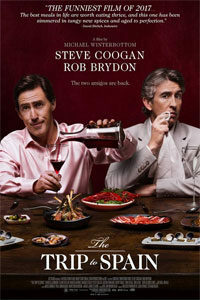 Though there’s no onscreen credit for a screenplay, the film incorporates real-life details about Coogan and Brydon’s careers into the mix. Fresh off twin Oscar nominations as producer and co-writer of his 2013 dramedy Philomena, Coogan’s pride and self-admiration seem unruly when he expects a Spanish bartender to be impressed by his credentials. 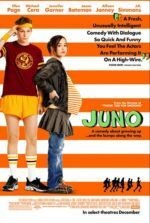 He has a new script he’s shopping around Hollywood, but the studio wants a rewrite by a new up-and-coming writer. “Why?” Coogan wonders. “I am here. I’ve arrived. I’ve come.” Despite his success, validation remains out of reach. Brydon, meanwhile, remains proud of his role as a dwarf in The Huntsman: Winter’s War (2016), and would rather enjoy his domestic life than uproot his family for a better shot at Hollywood. Then again, Brydon’s continuous Roger Moore impression during an otherwise serious discussion of the Moorish invasion of Spain might create some sympathy for Coogan—except he’s only talking about ancient history to sound intelligent in front of an attractive photographer. 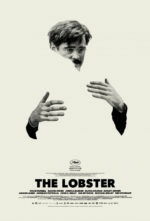 The dinner table improvisation is more playful in this film, in that Coogan seems to accept Brydon’s behavior, as opposed to the first film, when you wondered if Brydon would survive the journey. More than just impersonations and competitive discussions of Spanish history, they improvise several complete skits. Take a scene where a server delivers two oysters on a single plate, and the two patrons engage in a James Bond scene, acting as though one of the oysters has been poisoned (But which one!?). There’s also a hilarious bit about a campy “tentative Nazi” that might split a side. Of course, the film also has a dark edge to it, especially when it explores the state of Coogan’s downcast relationship with his family. Since show business remains a thankless and cruel beast, Coogan finally begins to understand the importance Brydon places on his family. However, it may be too little, too late. As in the previous two, the film makes excellent use of the location’s cultural history to reflect Coogan’s existential crisis of the moment. It comes as no surprise that Cervantes imagery, specifically the Noel Harrison song “The Windmills in Your Mind” (touchingly sung by Coogan and Brydon during a scene through winding roads), play heavily into the proceedings. The film returns to an unsubtle parallel between Coogan and Don Quixote’s ambition, and failure, to achieve a permanent and meaningful standing. As ever in these films, The Trip to Spain alternates between hearty laughter and bittersweet moments, making them a reliably funny and meaningful series. If they were just food and laughter, they might be gratifying, entertaining escapes. But Winterbottom, Coogan, and Brydon turn them into a melancholic exploration of humor, comedy as art, cuisine, history, scenery, and Coogan’s questions of Self. With so much to savor, here’s hoping another trip is on the way.